by Dr. George Winslow Plummer. A series of lessons on esoteric Masonry dating from 1931-1932. Plummer was a member of both York and Scottish Rites of Freemasonry, and was also a members of several groups that had a Masonic requirement. 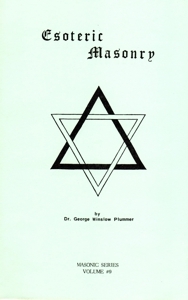 A series of lessons on esoteric Masonry dating from 1931-1932. Plummer was a member of both York and Scottish Rites of Freemasonry, and was also a members of several groups that had a Masonic requirement.